The Toradex Apalis iMX6 is a small form-factor Computer on Module/System on Module that comes in both quad core and dual core versions based on NXP i.MX 6Q and NXP i.MX 6D SoCs respectively. The Cortex A9 quad core and dual core CPU comes with two variants: the commercial temperature one peaks at 1 GHz, while the industrial temperature one has a peak frequency of 800 MHz. 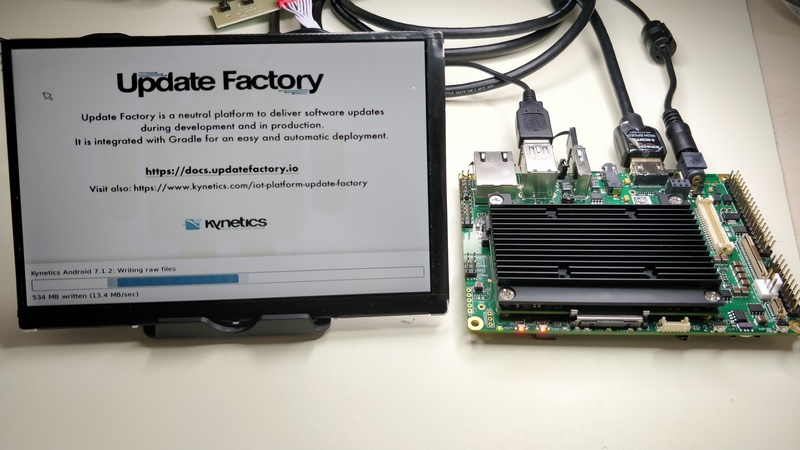 After the release of the vanilla image of Android 7.1.2 (Nougat) for both the Toradex Colibri i.MX7D and i.MX6DL SOM, Kynetics is excited to release an image of Android Nougat for the Toradex Apalis i.MX6Q SOM compatible with the Ixora carrier board. The image supports OTA updates through Update Factory. The following steps will guide you through the installation of Android 7.1.2 on the Toradex Ixora V1.1 board with Apalis i.MX6 SOM. Kynetics Android for Apalis i.MX6 binaries package, can be downloaded from here. Follow the instructions from Toradex to flash the Easy Installer if it is not already running on your board. 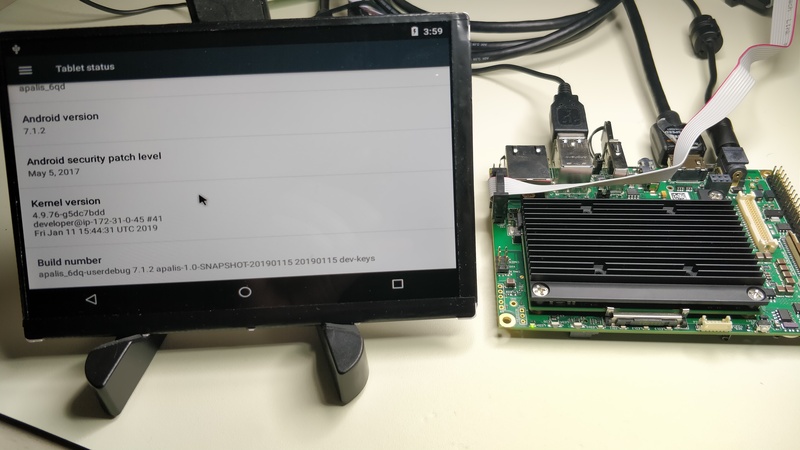 Proceed with the following steps to install Android Nougat on the Toradex Ixora board with Apalis i.MX6 SOM. Unpack the Kynetics Android for Apalis i.MX6 binaries package in the first partition of the USB drive. The partition should be formatted in FAT32. Power on the board and start the Toradex Easy Installer. Plug in the USB drive in the USB port on the connector X7 or X8 (upper port). The display will show the Kynetics Android 7.1.2 image available. Double click with the mouse on the Kynetics Android 7.1.2 description and confirm with 'Yes' to start the installation procedure. After some minutes, the Easy Installer will ask to reboot the board. Confirm and reboot the board. The new Android 7.1.2 should start. The Atmel touch controller needs to be flashed with a configuration file in order to have a working touchscreen. Usually, the display comes already configured correctly. If the touch is working fine on your unit, you can skip this point. The controller configuration is a one time task and it is independent from the OS, so if you have already flashed the configuration on the chip, you can skip this point. If the board is connected only to the HDMI display, you can skip this point. To flash the configuration file, both the flashing app and the configuration file needs to be prepared. The configuration file is provided by Toradex here. To source code of the flashing app is available on the Atmel github repository. You can compile it for Android following the instructions of the README, however Kynetics provides the binary already compiled here. NOTE: Do not rename the xcfg file. After reboot, the touchscreen will work and you are ready to enjoy Android on the i.MX6 Apalis System. How long the installation procedure will take? The Easy Installer needs about 3 minutes to flash Android, however this depends on the USB drive speed. Is it possible to use a different display? Refer to the Toradex documentation for further video options. Yes, ADB works using the microUSB port on connector X8. Note that in order to have ADB working the port should work as USB device port: the jumper JP2 should be configured as open. If the jumper is closed, the port works as USB host port and it is possible to use it with a mouse or a USB drive. Refer to the Ixora datasheet for further informations. Enjoy the Art of Coding™!